An alternative for those installations that cannot take a gas or wood burning option, electric fireplaces can provide a dramatic look for your decor without the heat. 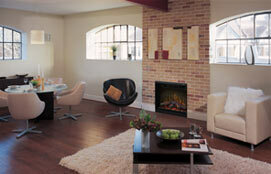 Redefine one or many of your favorite spaces with a gorgeous electric fireplace. Dimplex offers you the widest array of top-quality designs, from flat-wall fireplaces, to media consoles, to wall-mounts and much more. Welcome to our Showroom! Safe, economical and beautiful! Superior electric fireplaces offer the warmth you want from an electric fireplace with realistic beauty you won't find anywhere else.